For many of you, offering a Professional Learning Portfolio is CORE to your organization’s mission. Your community needs to remain abreast of what’s happening in their profession, and they depend on you as their primary source for lifelong learning. When we designed Elevate LMS, your priorities led the charge. We want to provide you a solution that will position your learning portfolio as a centerpieces in your community. Have you evaluated your learning strategy and how to ensure your members are regularly informed and engaged? Does your current LMS inhibit or aid in that strategy? If not already leveraging an LMS, is implementing one the right answer? To help you in your review of LMS options we have established a ten-step guide that can be a foundation for your review process. 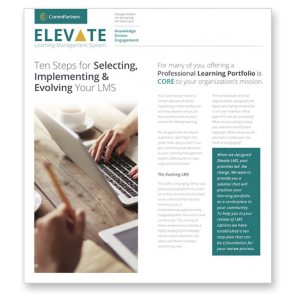 Are you currently looking for an LMS?